Thank you so much to all of you who were able to attend our Lessons and Carols service yesterday. It was such an enjoyable time for our first and sixth grade students and has been a tradition here at BES for many years. Next Wednesday, December 19th, is our annual Pajama Day and classroom Christmas parties. The children may wear appropriate pajamas for the event. We will begin the day celebrating Eucharist in the church sanctuary and then head back to the classroom until 10:00 a.m. At that time, students will walk over to Stormes Hall for hot chocolate, a special story, and Christmas carol sing-along. Then, they will conclude the morning in the classroom with their class parties and an early dismissal at 11:30 a.m. Please remember that there is no Extended Day on this day. All of us here at BES wish you the happiest of holidays and look forward to an amazing new year! Make plans to join us for the annual BES Pajama Day on Wednesday, Dec. 19th. Students may dress in their favorite pajamas on this special day. Check out this special "BES Christmas Joy 2018" video featuring our students having fun as they learn together at Beaches Episcopal School. We wish you a memorable Christmas season as we are reminded of the reason for our joy - God with us. If you have not made your gift to the Starfish Fund, the countdown is on. The annual giving campaign for Beaches Episcopal School runs through December 31, 2018. By making a gift every year, in any amount, you build upon our legacy of academic excellence and directly impact the lives of those in our care. Just as a reminder, here's a flyer showing the current parent participation percentages by class for this year's Starfish Fund. Help bring your class up to 100% so that they can have a Dress Down Day in the new year. Donate or pledge your gifts by December 31, 2018. Pledge payments are accepted until May 24, 2019 (the last day of school). 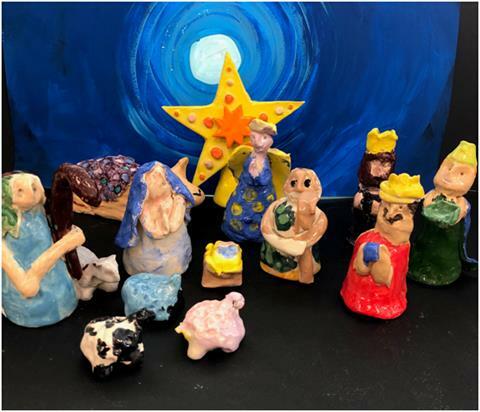 Your student’s clay Nativity piece will be coming home with them today. Each year, a new piece is created to add to their very own Nativity scene. It will be complete by their sixth grade year. Students that are new to BES this year have created Joseph and Mary holding Baby Jesus. Below is a list of what students in each grade level create each Christmas. BES will not offer any after-school activities on the week of December 17th due to Christmas Break starting later in the week. Offerings will begin again the week we return from break (January 7-11, 2019). 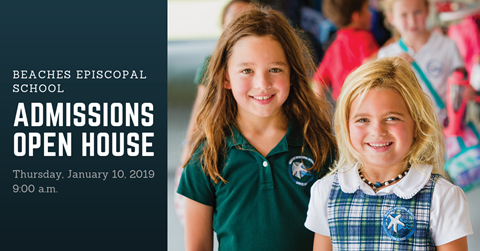 If you know of a neighbor or family member that is looking for an independent school with over 65 years of academic excellence and a loving, Christian environment, please let them know that we would enjoy getting to meet them at an Admissions Open House on Thursday, January 10, 2019 at 9:00 a.m.
During the Open House, they will enjoy refreshments, a guided campus tour, and a question and answer session from our administration, faculty, and parents. Thank you for sharing your story with those in your sphere of influence so that their students can begin their journey towards success and significance through the lens of a Beaches Episcopal School education. Register Your Students for Flag Football and Volleyball Today! We are now accepting registrations for Flag Football and Volleyball teams at BES. NEW THIS YEAR: Flag Football Open to Third Grade Students! All parents must also complete a BES Parental Waiver and Consent Form with their registration forms. Please complete and return both forms to the front office ASAP as space fills up quickly. Practice days: Volleyball on Tuesdays from 3:15-4:15 p.m., 5th and 6th Grade Flag Football on Wednesdays from 3:15-4:15 p.m., 3rd and 4th Grade Flag Football TBA. Practices will begin the week of January 7th. Games will begin the week of January 21st. Games for JV will take place on Monday, Varsity on Tuesday, and Volleyball on Thursday. We are looking for a head JV coach, so please email Mrs. Novak if you are interested. Go Rays! Thursday, January 10th at 9:00 a.m.